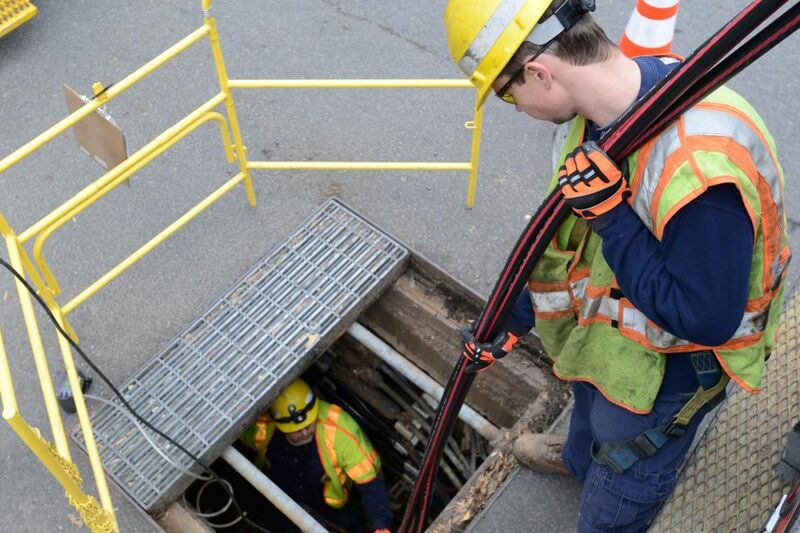 Utility workers install underground power lines to Pepco utility, which serves Washington, D.C, and parts of Maryland. The utility is embarking on a six-year $500 million effort called DC Power Line Undergrounding (DC PLUG) to bury some of the more vulnerable aerial power lines in the capital. The two powerful winter storms that knocked out electric power to a total of 750,000 Peco customers last week have demonstrated once again the vulnerability of overhead power lines to heavy snow and high winds, prompting calls for the Exelon Corp. subsidiary to bury its lines. "The problem is not storms," said Arthur Alan Wolk, a lawyer who lost power for six days last week at his Gladwyne home. "The problem is that Peco, which is just a money profit center for Exelon, still strings wires from poles like they did in the 1800s." The Philadelphia utility, with the assistance of 2,800 workers from other utilities that rushed in to aid recovery efforts, said Friday it expects to restore service by Sunday to the last customers knocked out by the nor'easters. About 3,000 were still without power Friday evening. But another storm could come as early as Monday as the debate over storm-proofing the distribution system rages on. Consider the experience of Pepco, the Washington-area utility, which is also owned by Exelon. Pepco embraced an "undergrounding plan" several years ago after the nation's capital suffered through several prolonged storm-related outages from 2010 to 2012. The District of Columbia Council in 2014 approved legislation calling for a $1 billion plan to bury power lines. The cost would be shared by Pepco and the city, but almost all of it will be passed on to ratepayers. The plan was challenged in court by the Apartment and Office Building Association of Metropolitan Washington, which forced the district to rewrite the law last year and scale it back to $500 million over six years. The first power lines will finally be buried this year. David M. Velasquez, president and chief executive of Pepco Holdings. "It's a fairly complex plan," David M. Velasquez, the president and chief executive of Pepco Holdings, said Friday. The first two-year phase of the project will bury primary distribution lines on six "feeders," or about 47.5 miles of trunk lines, at a cost of $134 million, according to the company's filing with the district Public Service Commission. That's about 3.3 percent of the city's 1,430 miles of aerial lines, affecting 7,858 customers. The project will initially increase monthly bills by $1.19 for customers using 675 kilowatt hours a month. Underground power lines are generally more reliable than overhead wires, according to a 2012 study by the Edison Electric Institute. But they cost five to 10 times as much to install as overhead wires, and are more expensive and time-consuming to repair when they fail. They also have a shorter expected lifespan than aerial wires. Peco says 9,322 miles of its 22,278-mile system of power lines, or 42 percent, is already underground. Many commercial areas, such as Center City, have underground systems, as do developments built in the last 50 years. But regulators like the Pennsylvania Public Utility Commission are reluctant to approve utility requests to pay to bury power lines unless they can be shown to be "prudent" investments. The rationale is that other customers shouldn't be compelled to pay for an upgrade that benefits only a few customers, unless it can be demonstrated to be cost-effective. "Burying power lines comes at a substantial cost, and those lines could still be vulnerable to flooding and other hazards," said Nils Hagen-Frederiksen, the PUC spokesman. "Utilities do have infrastructure improvement plans, which are carefully reviewed and considered by the commission." Contract utility workers pull a downed Peco power line in Aston on Thursday before reconnecting it. About 70 percent of the Pepco system in Washington is already underground, but studies the company conducted a few years ago estimated that putting all of its system underground would add $107 to the typical residential monthly bill if the utility recovered the cost in 30 years. "When we looked at the cost of the remainder of the city, the other 30 percent, it was billions and billions of dollars, completely, I'd say, cost-prohibitive," said Velasquez. The utility and district officials instead decided to focus on the most critical aerial lines that had histories of outages. Only primary feeders are getting replaced, not the secondary lines that feed most residential streets, which will still be vulnerable to storm events. But Velasquez said the utility is making other improvements to harden its distribution system, such as installing tree-resistant insulated cables, modern switching equipment, and more robust poles. The Washington initiative, dubbed DC PLUG for DC Power Line Undergrounding, calls for the city to build the underground civil infrastructure, after which Pepco will install its equipment. It is a massive undertaking, requiring coordination with local residents and businesses that will be disrupted by street excavations. "This is being done for the community," said Velasquez. "It's critical for us that we're mindful of how it impacts the community during the construction period." The plan to bury power lines in densely populated Washington may not be the best approach in more lightly developed areas, said the Pepco CEO. For instance, he also oversees Exelon's Atlantic City Electric utility, which recently submitted a $338 million infrastructure improvement plan to New Jersey regulators that includes very few proposals to bury power lines. "Once you get out of such a dense area, when you look at the cost-benefit, there are very often other ways of improving resilience," he said. Unfortunately, no system is completely storm-proof.